All UK employers must enrol their workforce in a workplace pension scheme by their ‘staging date’. It is important that you start to prepare now for Auto Enrolment so that you can control costs and minimise disruption to your business. We would like to remind you of our free Auto Enrolment Seminar being held tomorrow from 9-11am at Greenmeadow Golf and Country Club. 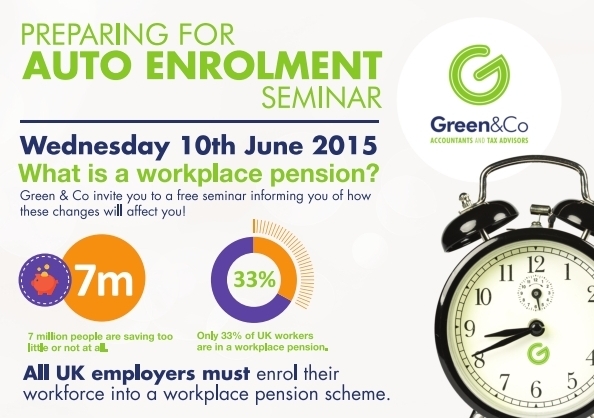 What is Auto Enrolment and why is it being introduced? When will Auto Enrolment be introduced and who will it affect? The steps of Auto Enrolment including what you need to do now. If you would like to book a place on this free seminar, please contact the office on 01633 871122 or email samuel@greenandco.com.